Parker Duofold Junior fountain pen from 1923-7. 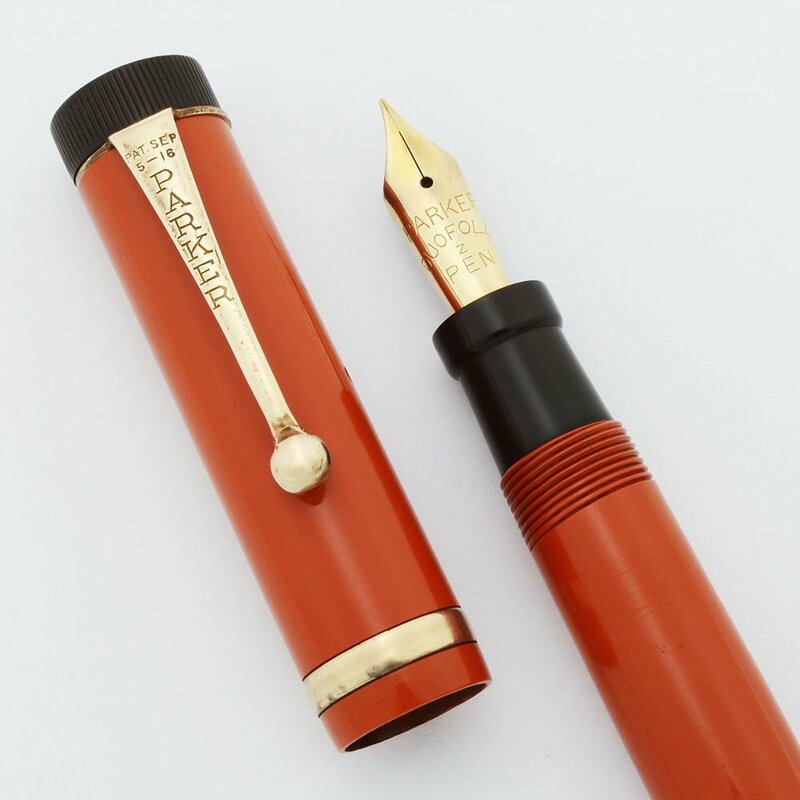 Button filling pen in the red permanite finish with gold plated trim and a single raised cap band. Fine gold Parker Duofold Pen nib is smooth and firm. Excellent condition, fully restored and working well. Type Button filling fountain pen, restored and working well. Product Name Duofold Junior (it's marked on the barrel). Manufacturer and Year Parker, made in U.S.A. -- 1923-7 (those were the years this raised cap band style was used). Filling System Button filler. We have fully restored and tested the filling system, it's working very well. Color Red (orange permanite) body and cap with gold plated trim and a single 1/8-inch wide cap band which is raised. Nib FINE Parker Duofold Pen nib. The nib is in great condition. It's quite firm, but smooth. There is a "Z" imprinted on the nib. Condition Excellent condition. The knurling in the black pieces is strong. The permanite is unstained and without scratches. The barrel imprint is legible. There are small marks towards the middle of the barrel that look like bite marks. The cap band and clip have some plating wear. There are no cracks. The pen is working well. Stupid question, perhaps. The length of pen is given as 4 9/16 inches. Is that measured with the cap on or with the cap off, please?